Kitchen! Kitchen! 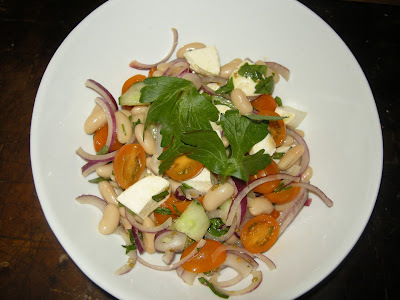 : Refreshing cannellini salad and cucumbers.....at kitchen! kitchen! Refreshing cannellini salad and cucumbers.....at kitchen! kitchen! Oct. 3, 2011 -"Pan Seared Steak with Cannellini Salad". a pint of yellow or red grape tomatoes, and basil for touches of color. You may add an ingredient or two to your dish or take out one as long as the result is delicious and to be enjoyed by your family and friends. I added some diced english cucumbers to the salad and a squeeze of 1/2 a lime with extra virgin olive oil. Let the salad stand for a half hour for all the ingredients to absorb the lemon and olive oil. It is a great accompaniment to any meat dishes. It makes everything taste light and refreshing.